F1: Where is Max Verstappen’s head at? Considering Max Verstappen’s start to the 2018 Formula 1 season as a disaster would be an overstatement but the Dutch driver failing to reach even minimum expectations is putting it lightly. The Red Bull driver’s record this year reads more like a roll call of errors and his latest misdemeanour at the Azerbaijan Grand Prix, the cardinal sin of crashing out with your teammate, has intensified the spotlight which had already been glaring very brightly on him. So where is Verstappen’s head at? This is less of a Basement Jaxx line and more philosophical crossroads for the 20-year-old who is considered by the majority as a future F1 world champion. Verstappen certainly holds all the cards which could hand him a world crown in the near future with a bumper long-term Red Bull deal, a team considered to be moulded around his ambitions and an expected resurgence from the four-time F1 world champions which continues to flicker into life against such strong rivals in Ferrari and Mercedes. But four races into 2018 and a potential title tilt is in tatters languishing 52 points off leader Lewis Hamilton when a maximum of 100 points have been available. Verstappen’s unrelenting aggression in his race craft was applauded when he burst on to F1’s centre stage, while ironically his first major triumph came from perfect race management for victory at the 2016 Spanish Grand Prix on his Red Bull debut, and many pundits have been quick to encourage the Dutch youngster despite his string of mistakes so far this year. But Verstappen’s record this year makes for uncomfortable reading if you are of an orange persuasion. A spin while chasing the front-runners in Australia, partly caused by bodywork damage, saw Verstappen’s charge fall flat to a sixth place. A crash in qualifying for the Bahrain Grand Prix sent him down the order, blaming a power surge which Renault denied, before tripping over Hamilton on the opening lap which triggered his retirement. After Hamilton’s “dickhead” comment, Verstappen made fewer friends with his overtaking exploits in China when he almost collided with Hamilton again before clattering into Sebastian Vettel when initially a victory had looked odds-on after the timely safety car. Despite a time penalty, Verstappen was fortunate to finish in fifth place given Vettel dropped further down the order due to damage inflicted by the Red Bull driver. Then came the Azerbaijan Grand Prix, Thursday arrived with media scrutiny and he accepted over faults from China and looked to wipe the slate clean. A crash into the barriers in FP1 wouldn’t have calmed any emotions but qualifying fifth gave him a shot at a solid result he badly craved. It wasn’t to be. 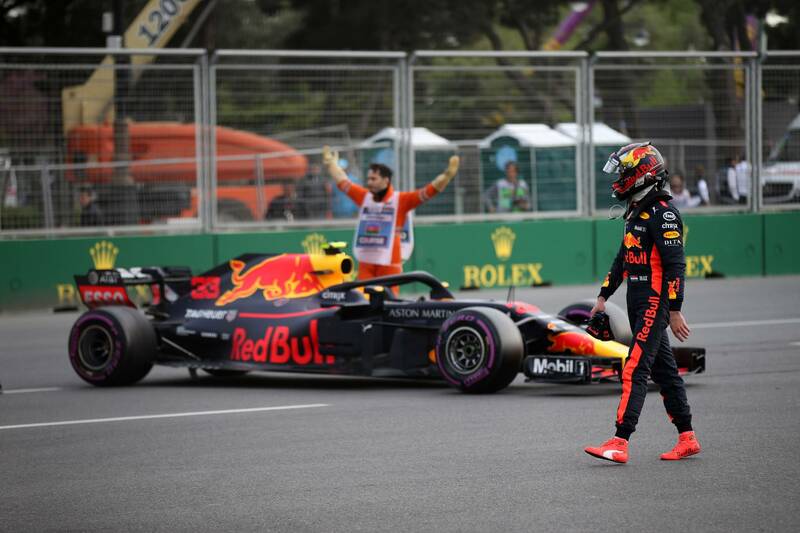 Many said ‘it had been coming’ between Daniel Ricciardo and Verstappen after their near-miss and bump of wheels when the Australian driver overtook his Red Bull teammate the first time in Baku. A quick attack during the pit stops saw the Dutch driver jump back ahead with the overcut but as he continued to struggle for outright pace it meant round two between the pair was fast approaching. 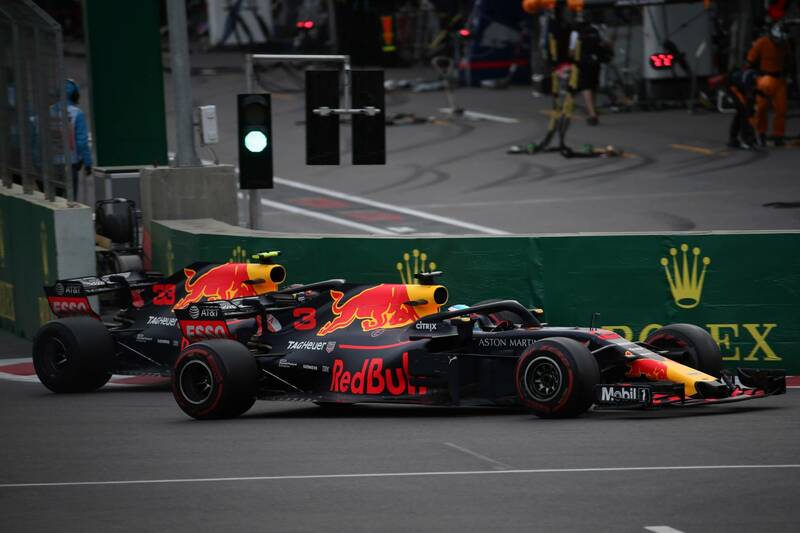 Red Bull has been quick to apportion equal blame for the clash which eliminated both drivers, more on that later, as Ricciardo lined up for a dive up the inside of Verstappen into Turn 1 in a carbon-copy pass of his earlier move. Verstappen, wise to the tactic, blocked the line but knowing Ricciardo is a late-braking master his decision to throw out the anchors was only going to bring one result. The blame game could go on all the way to the Spanish Grand Prix, while the FIA opted to shrug its shoulders and hand out the same punishment of a reprimand for each driver, but what was key to the crash was the split-second decision from Verstappen which proves both the winners’ instinct but also a lethal flaw. Verstappen, with full knowledge of Ricciardo’s plan given his previous move plus his three-in-one overtake last year in Baku which paved his path to victory, opted to play chicken with his Red Bull teammate by trying to force him to back out which risked both their races. Given the speeds and with no real alternative line so close to the inside wall Ricciardo duly collected Verstappen resulting in a Red Bull carbon fibre confetti show at Turn 1. Locking horns with the likes of Vettel and Hamilton is a show of fierce rivalry but to plot against his Red Bull teammate demonstrates Verstappen’s mental ruthlessness to win without counting the cost of who signs his paycheques. Was the pressure getting to Verstappen after his poor start to the year coupled with Ricciardo’s win in China which could have easily been his? It’s likely. Verstappen also has the added pressure of a heavy-duty contract at Red Bull which means he must continue to prove his potential and worth if the team is going to hedge its long-term bets with him compared to Ricciardo who remains the hottest property available on the F1 driver market. Nobody expects the latest events to echo the fallout from Daniil ‘Torpedo’ Kvyat who was axed from Red Bull and replaced by Verstappen at the next race, despite the mirrored timing of events with the Spanish GP next up, but it’s worth noting the Russian driver had a marginally better start to his doomed final stint at Red Bull and sustained fewer crashes. Given Red Bull’s expected resurgence in Barcelona at the less power-dependent Circuit de Catalunya the Milton Keynes-based squad will be looking for an emphatic response to quell the media scrutiny mounting. Verstappen will be able to reset his mind with a couple of weeks away, after apologising to the Red Bull team and receiving his slap on the wrists from team bosses Christian Horner and Dr Helmut Marko, and should aim to focus on what fuelled the plaudits which tip him as a potential world champion. Two years on from becoming the youngest-ever F1 race winner many may have predicted to see Verstappen’s win tally be much higher than three, himself included, but with a 2018 world championship challenge already drifting away his best tactic would be to concentrate on race-by-race to break his poor run of form. Arguably the mark of a true sporting great is how they recover from the lows and Verstappen’s previous mental fortitude gives grounds to the Dutch star shaking off the current spate of high-profile clashes. Indeed, if his previous incidents with rival team drivers left Verstappen humbled, apologising to Vettel immediately after China certainly allowed a flood of water to pass under that bridge, a crash with his teammate – one he shares a publicly strong relationship with – could be the wake-up call. Verstappen still has great potential and awesome speed but he cannot let this current wrongdoings have bigger consequences on his future.